This year for Rosh Hashanah, I decided to experiment with a new Weight Watchers Chicken Recipe utilizing some delicious, fresh fall figs, honey, and saffron. It was really quite simple to prepare and the chicken turned out so moist and juicy. The figs and honey (very traditional Rosh Hashanah ingredients) gave it a lovely sweet contrast, while sill keeping the the Points value pretty low and not over powering the chicken. I served this over whole wheat Israeli cous cous (for extra Points), along with roasted broccoli and cucumber salad for a complete meal. I was making this dish for my whole family, so I also added some chicken thighs and drumsticks, which were a huge hit. This could definitely become my new Weight Watchers Rosh Hashanah Recipe tradition! 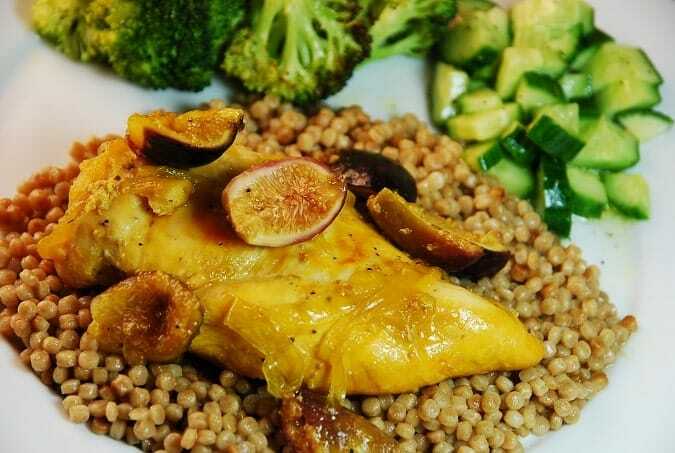 Succulent, sweet, honey roasted chicken served with caramelized onions and figs makes one very delicious and healthy dish. Perfect for a Weight Watchers Rosh Hashanah dinner recipe or for any fall dinner. Spray a large Dutch oven with nonfat cooking spray and set over medium high heat. Add in onions, and saute until translucent, about 8-10 minutes. Meanwhile, in a small bowl, combine olive oil, saffron, coriander, salt, pepper and paprika to form a paste. Rub evenly all over pieces of chicken. Place chicken in Dutch oven, and pour honey over top. Turn heat down to medium. Cover and cook until chicken is almost cooked through. About 15-20 minutes before chicken is ready, drain any excess liquid from the pot. Toss in the figs, and cook until chicken is cooked through, basting regularly to keep the chicken and figs well coated.